I’ve heard most of the deposits belong to people outside of the country, so tax loopholes make sense. I think you’re right. They just changed their proposal from the original agreement reached over the weekend in Brussels. Under the new proposal, people with less than €20,000 in the bank would not have to pay any taxes. Those with between €20,000 and €100,000 would lose 6.75% of their savings, and people with over €100,000 would lose 9.9%. People are protesting on the streets, ATMs are out of money, doesn’t seem like a fun place to be in right now. supposedly most of the money in Cyprus high net worth bank accounts are Russian hot money, aka dirty money from Russian mafia. Cyprus is a well known tax haven for Russian laundering, so the tax seems like a pretty good idea to me LOL, but then again, maybe anyone who votes for it, will get their families killed by russian mafia! That’s what I’ve been reading too. It’s a way to crack down on illegal banking practices 🙂 The mafia or whoever they may bey should think about storing their wealth somewhere else other in legal tender form. If I had €100,000 in another country I would go there and buy some gold or colored diamonds and then put that in a safety deposit box. Money doesn’t hold value very well over time and you risk these types of situations. I like how the gold coin is sealed up… you can’t actually touch it! Too precious!! That’s one good looking coin! What is the mintage on that coin? Makes me want to buy one too! Thanks for reminding me about the seal. I just realize I didn’t really describe the packaging lol. I’ve edited the post and included a photo of the back side now with specifications like weight and diameter 😀 The RCM didn’t say what the exact mintage is because they’ve been making these every year since 2007 I believe. The best guess is however much they can make with their available 99999 raw gold. I invested in forex gold 7 years ago below $600, with leverage. It went up, down, freaked me out and I can’t get over my emotional decision to sell back then!! That sounds intense. I think I’m going to hold onto my gold and use it for emergencies only. The price of gold is definitely affected by peoples’ emotions. However, over the last few years, I have thought about doing this more and more. I would do it to provide some diversification for my portfolio, but also because I do worry about the erosion of the value of our currency. That was a nice purchase you made. How are you charged 1750 when gold is near 1600 today? I wonder how it will all play out for them. Normally countries have deposit insurance. In Canada if you have $100K or less money in a bank the government will guarantee that nothing will happen to it even if all the banks go bankrupt themselves. I believe there’s a similar rule in the US. This makes bank deposits even safer than GICs or government savings bonds. I heard the reason the insurance didn’t trigger in Cyprus is because the banks didn’t actually go out of business. But I think it kind of defeats the point of having insurance. Ah, the true definition of hard currency… It is about bloody time to bought some. I hold a few “coins”. 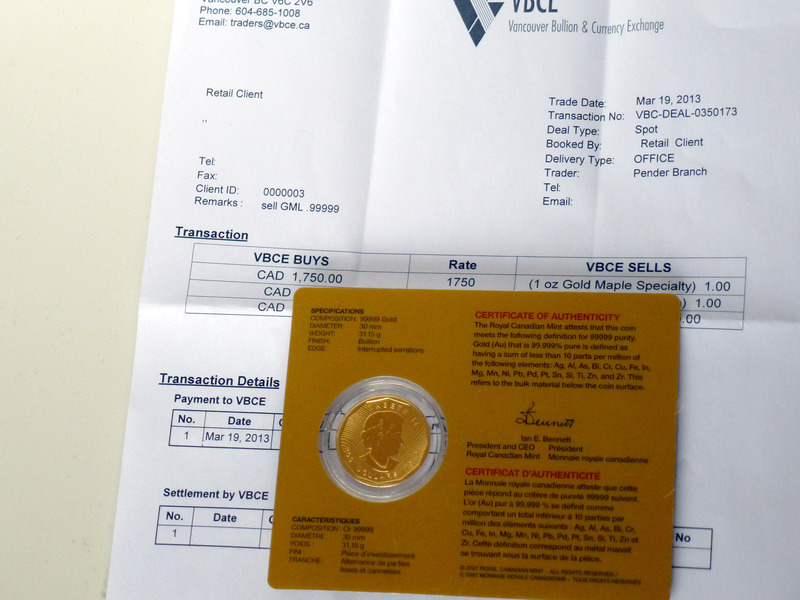 I have been a buyer since 2001 of gold bullion and silver. It is something special to think just one of those coins could be exchanged for a beater car out on the road… Certainly brings in itno perspective. I know the gold coin weighs an ounce, but does it not see odd how heavy it is in relation to it’s size… Ah… i have dream and aspirations of purchasing a 100oz silver bar… Just have not found an interesting argument to convince my wife we could use a neat looking door stop (O>o) – Cheers. 100 oz silver sounds like a lot. Must hurt like crazy if it was accidentally dropped on someone’s foot lol. Good thing silver is much cheaper than gold. I’m thinking the next precious metal purchase I make will either be a 10 oz silver bar, or 32 oz silver collector coin. That is a nice coin. 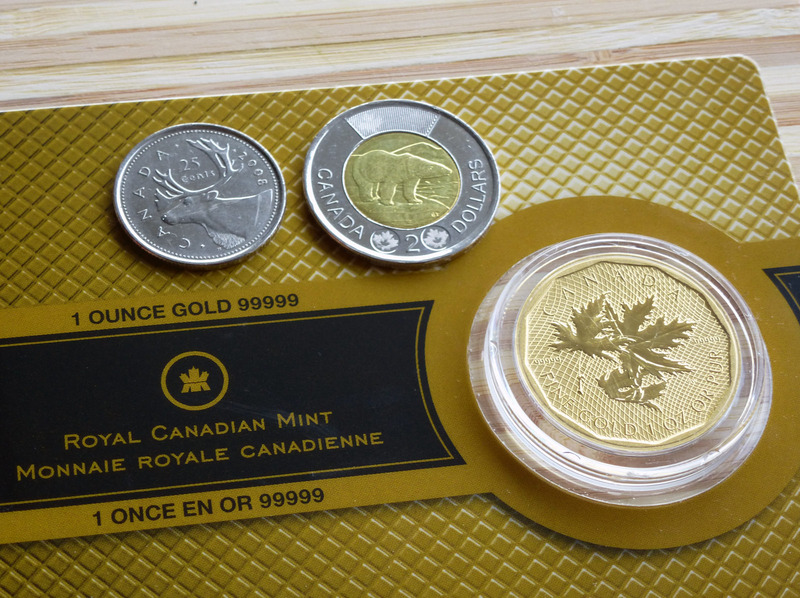 I have a couple of the 1/10 oz gold maples. Could not quite stretch my finances to the 1 oz. I don’t ever intend to sell my coins – I just like collecting them but the option is always there. I probably wont sell my gold and silver coins either unless it’s for an emergency. Many people like to have cash in the bank they call an emergency fund. But I prefer to hold my emergency fund in the form of hard assets. I can take my coins back to the bullion dealership today and get cash for them. But if I don’t run into an emergency my fund doesn’t lose any purchasing power due to inflation. But it’s good to have a little bit of liquid cash on hand as well because the price of gold and silver is always fluctuating. That is a neat looking coin you picked up today. I was going to ask you where in the world you would keep the coin especially if you wanted to buy a few more until I read that you might get a safety deposit box. I’d be nervous just keeping that in the house but what do they charge to hold a safety deposit box at the bank? I think safe deposit boxes are usually $50 a year to rent. I have content insurance for my home anyway. In the event somebody breaks in and steals all my stuff, or if there’s a fire and I lose everything, the insurance company will cover up to $30K of damage, including rare coins and collectibles. Right now I barely have $10K worth of stuff in my apartment haha. Simple life is best 😀 I don’t like clutter. Gold’s plunge to $1,350 / oz is truly a scary occurrence. I’m legging in now, but am losing money. Hope thing stabilize and rebound!